This impressive semi-detached property for sale in Peyia is situated on a small friendly complex in a quiet residential cul-de-sac and neighbourhood of Peyia. A good range of local amenities are within easy walking distance including shops, bars and medical centre and the popular tourist resort of Coral Bay with it’s fantastic sandy beaches is only a few minutes’ drive away. Single garage/workshop with electrically operated shutter door; central seating/games area leading to utility room; shower room and double bedroom; covered outdoor veranda with fitted hammocks accessed via the pool area. Central landing leading to master bedroom including en-suite facilities and large, L-shaped veranda with lovely sea & mountain views; family size bathroom; bedrooms two and three with easy direct access to a rear covered veranda. Amazing living space including spacious lounge, formal dining area and modern fully fitted kitchen with stylish white units; L-shaped, partially covered veranda with decking offering fabulous leisure space to relax and take in the gorgeous views; further veranda space to the rear off the dining area. Impressive mosaic tiled communal pool with roman steps, surrounding sunbathing terrace and pool shower. 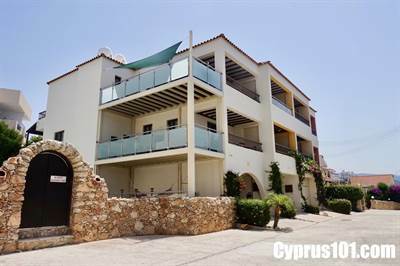 In summary, this property is a complete turn key opportunity and highly suitable for those looking for a spacious permanent or holiday home/rental investment with great views and within easy walking distance to amenities. The property comes fully furnished and has full title deeds.